Whether you need to build a traditional login form, an API token authentication system or you need to integrate with some proprietary single-sign-on system, the Guard component can make it easy... and fun! In this example, you'll build an API token authentication system and learn how to work with Guard. This User doesn't have a password, but you can add a password property if you also want to allow this user to login with a password (e.g. via a login form). Suppose you have an API where your clients will send an X-AUTH-TOKEN header on each request with their API token. Your job is to read this and find the associated user (if any). Nice work! Each method is explained below: The Guard Authenticator Methods. To finish this, make sure your authenticator is registered as a service. If you're using the default services.yml configuration, that happens automatically. Now, learn more about what each method does. This will be called on every request and your job is to read the token (or whatever your "authentication" information is) from the request and return it. If you return null, the rest of the authentication process is skipped. Otherwise, getUser() will be called and the return value is passed as the first argument. If getCredentials() returns a non-null value, then this method is called and its return value is passed here as the $credentials argument. Your job is to return an object that implements UserInterface. If you do, then checkCredentials() will be called. If you return null (or throw an AuthenticationException) authentication will fail. If getUser() returns a User object, this method is called. Your job is to verify if the credentials are correct. For a login form, this is where you would check that the password is correct for the user. To pass authentication, return true. If you return anything else (or throw an AuthenticationException), authentication will fail. 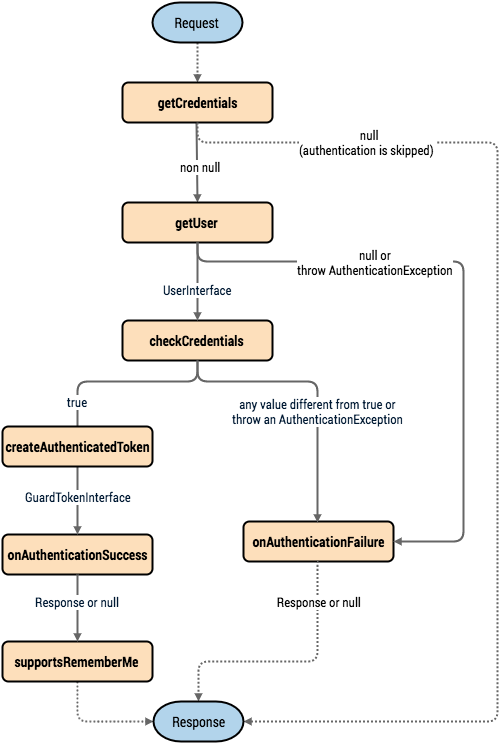 This is called after successful authentication and your job is to either return a Response object that will be sent to the client or null to continue the request (e.g. allow the route/controller to be called like normal). Since this is an API where each request authenticates itself, you want to return null. This is called if authentication fails. Your job is to return the Response object that should be sent to the client. The $exception will tell you what went wrong during authentication. This is called if the client accesses a URI/resource that requires authentication, but no authentication details were sent (i.e. you returned null from getCredentials()). Your job is to return a Response object that helps the user authenticate (e.g. a 401 response that says "token is missing!"). If you want to support "remember me" functionality, return true from this method. You will still need to active remember_me under your firewall for it to work. Since this is a stateless API, you do not want to support "remember me" functionality in this example. If you are implementing the GuardAuthenticatorInterface instead of extending the AbstractGuardAuthenticator class, you have to implement this method. It will be called after a successful authentication to create and return the token for the user, who was supplied as the first argument. When onAuthenticationFailure() is called, it is passed an AuthenticationException that describes how authentication failed via its $e->getMessageKey() (and $e->getMessageData()) method. The message will be different based on where authentication fails (i.e. getUser() versus checkCredentials()). If you're building a login form, use the AbstractFormLoginAuthenticator as your base class - it implements a few methods for you. Then, fill in the other methods just like with the TokenAuthenticator. Outside of Guard, you are still responsible for creating a route, controller and template for your login form. If you're using a Guard authenticator to build a login form and want to add CSRF protection, no problem! First, add the _csrf_token to your login template. Can I have Multiple Authenticators? Yes! But when you do, you'll need choose just one authenticator to be your "entry_point". This means you'll need to choose which authenticator's start() method should be called when an anonymous user tries to access a protected resource. For more details, see How to Use Multiple Guard Authenticators. Can I use this with form_login? Yes! form_login is one way to authenticate a user, so you could use it and then add one or more authenticators. Using a guard authenticator doesn't collide with other ways to authenticate. Can I use this with FOSUserBundle? Yes! Actually, FOSUserBundle doesn't handle security: it simply gives you a User object and some routes and controllers to help with login, registration, forgot password, etc. When you use FOSUserBundle, you typically use form_login to actually authenticate the user. You can continue doing that (see previous question) or use the User object from FOSUserBundle and create your own authenticator(s) (just like in this article).